84 min [ This ain't no chick flick. ] 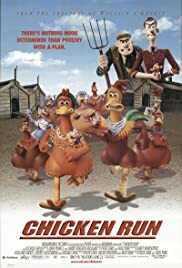 - Having been hopelessly repressed and facing eventual certain death at the chicken farm where they are held, Rocky the rooster and Ginger the chicken decide to rebel against the evil Mr. and Mrs. Tweedy, the farm's owners. Rocky and Ginger lead their fellow chickens in a great escape from the murderous farmers and their farm of doom.